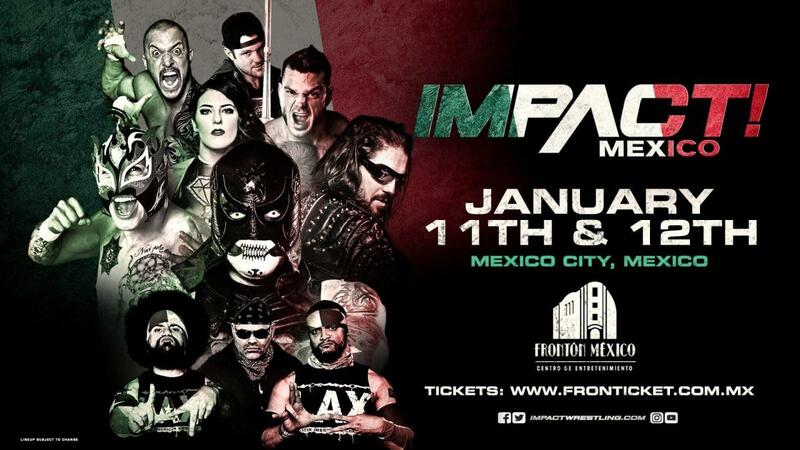 Impact Wrestling closed their set of tapings with night two at Fronton Mexico in Mexico City on Saturday. Here's what happened on night one if you missed it. This was a great, must-see match and a great showing for Hijo del Vikingo, who got a big reaction from the crowd. Swann pinned Vikingo after a 450 Splash. After the match, oVe came out to confront Swann. Sami Callihan talked about the history between he and Swann, saying that he was always there for him, more than his family, and so Swann owed everything he had achieved to him. Callihan offered Swann to join oVe, but he rejected the invitation. There was no clear interference from either Grace or Yung, but the finish saw Grace take out Yung, distracting Allie who left her guard down for Hogan to roll her up for the win. This was an action packed match that got a good amount of time. Miguel got a better reception from the fans and won with a top rope meterora. These two women went out there looking to give it their all. The spots in the match were not particularly violent in nature, but looked brutal live. There was a big board in the ring that they were not able to break even after a second spear against it. The finish saw Valkyrie hit a double foot stomp from the top rope onto Blanchard, who laid on a table. The crowd reacted well to the weapon spots and were behind the champ. In a short match, Mack pinned Page after a stunner. This was another great must-see match with four big dudes going all out. The fnish saw Impact hit Starship Pain on Moose while Cage hit the Drill Claw on Kross, but Impact covered Moose a second earlier so he won the match. Cage and Impact faced off afterward. Like on Friday, the reaction to Psycho Clown wasn't favorable. He won with La Magistral. King had a great reaction from the fans, while Callihan was a heat machine. Callihan pinned Puma King after a piledriver in a great match with a lot of time. The finish saw Drake hit the Gravy Train on Xavier after hitting him with Edwards' kendo stick behind the referee's back. After the match, Edwards complained to Drake about using the stick to win. Edwards brought out the stick to begin with, so I'm guessing he was just jealous someone else used it. The Lucha Bros got a big match entrance with Chinese dragon dancers. This was about as good as the Homecoming match, if not slightly better. The crowd was hot for the Lucha Bros, and when some fans started an 'Impact Wrestling' chant, the Cero Miedo chant would overtake it. The finish saw Pentagon pin Santana with the spike Fear Factor, while Fenix hit a Tope con Giro on Ortiz on the outside. After the match, all four men embraced. The show ended with all the babyfaces coming out to celebrate with the Lucha Brothers. They got an 'Impact Wrestling' chant going, and stayed for a while taking pictures with the fans and high-fiving all around. Bahh was really over with the crowd and pinned Raj after a Banzai Drop. Grace pinned Yung after a Pumphandle Half Nelson Driver.